General Information: The Golden-crowned Sparrow is a common, large sparrow in the family Passerellidae, genus Zonotrichia. This genus consists of four species: Golden-crowned, White-crowned, White-throated, and Harris’s Sparrows. Both the Golden-crowned and White-crowned species are commonly found in the Homer area. Range: Birders in Homer are fortunate to have this species as a summer visitor since it is not wide-spread – restricted in its range. Its breeding season range is limited to western Canada and Alaska. Migration takes it as far south as Baja California, spending much of its time on the western coast in weedy or brushy areas. A few birds will remain year-round in the Homer area – at lower elevations. The Golden-crowned Sparrow is a rare visitor to the Interior West U.S. and casual in the Eastern United States. Characteristics: Breeding adults have a distinctive, yellow fore-crown, with black stripes on each side of the crown. Besides the distinctive yellow crown, other field marks include a bi-colored bill, a gray-brown breast, with no spotting, and a pale brown rump. Immature Golden-crowned Sparrows are similar to immature White-crowned Sparrows. One of the key distinguishing marks between the two immature sparrow species is the color of the bill. The White-crowned Sparrow has a pinkish, orange bill while the Golden-crowned Sparrow has the bi-colored bill. Preferred Habitat: Low shrubs, dense vegetation. Breeding Season: Pairs are monogamous during the breeding season. Nest: Golden-crowned Sparrow build a thick cup nest generally on the ground at the base of a small, dense shrub or in a bank with overhanging plants. The nests are composed of small twigs, bark, ferns, dry grasses, and dead leaves. They will line the nest with fine grasses, hair, and feathers. Eggs and Incubation: Three-five eggs are typically laid. The female incubates the eggs 11-13 days. When hatched, the chicks are atricial (unable to eat on their own) and naked. Fledging: Both parents feed the young. Chicks quickly grow their downy feathers and leave the nest within 9 days, and are able to fly short distances 4 days later, thereby becoming independent. Food Preferences: The Golden-crowned Sparrow are omnivores – they eat both plants and animals. More is known about their winter diet, than their summer diet. In the winter they eat a variety of food types, including seeds (geranium, pigweed, starwort, dock, grasses, sumac, nightshade, knotweed), fruits (apples, grapes, elderberry, olive), grains (oats, wheat, barley, corn), buds, flowers, and plant sprouts. They will also eat insects (ants, wasps, bees, moths, butterflies, beetles, terminates, and flies). In the summer it is believed they eat insects, fruit, seeds, and spiders. Feeding Methodology: The Golden-crowned Sparrows is a ground forager, preferring to feed close to cover, gleaning for seeds or scratching leaf litter to uncover morsels. They often feed alone or in pairs. While they are less aggressive when feeding, they do defend breeding territories (approximately 2.5 acres in size). 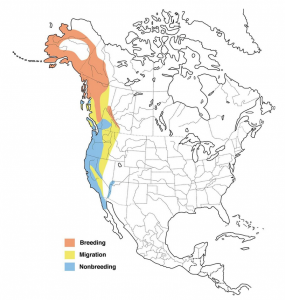 Migration: This bird’s entire population takes the same migration route each year – along the West Coast from its wintering grounds (anywhere northern Baja California to southern British Columbia, Canada) to its breeding grounds (in Alaska and Northwestern Canada) and back. Spring migration is April and May, while fall migration begins in late August. Wintering Golden-crowned Sparrows can usually be found in flocks with White-crowned Sparrows. Both species winter in small numbers in the Homer area. Song: A series of high clear whistles with a mnemonic of “I see you” or “Come see me” or even “Oh Pretty Bird”. At least that is what I hear when they sing. Try out a version that works for you. Flight Call: A high “seep”. Threats: Feral and outdoor domestic cats. Other birds, such as corvids (Raven, crows, magpies, jays) will predate the eggs and chicks of a Golden-crowned Sparrow. This species is also known as the “weary Willie” because it song sounds, to some, like “I’m so tired”. 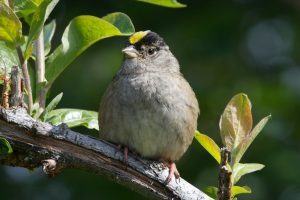 Miners in the Yukon at the turn of the twentieth century referred to the Golden-crowned Sparrow as the “no gold here” bird, because its song resembled that phrase. Conservation Status: The global population is estimated at 4.0 million species. The species is not on the U.S. State of the Birds Watch List nor Audubon Alaska’s Watch List. The International Union for Conservation of Nature lists the Golden-crowned Sparrow as a species of Least Concern; its population trend increasing. However, this species has had little study and it is not known how it responds to human influences. The effects of climate change on this species is also not known. With a restricted range, the bird may be vulnerable to habitat change. 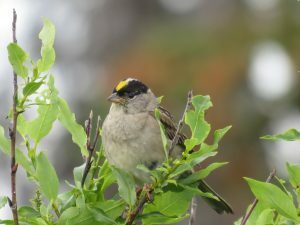 Other Sparrow Species in Alaska: Common sparrow species found around the Homer area include: White-crowned Sparrow, Savannah Sparrow, and Lincoln’s Sparrow. The White-throated Sparrow, Chipping Sparrow, and American Tree Sparrow are also occasionally found in our area. The American Tree Sparrow is a common species elsewhere in Alaska, unfortunately outside of the Homer area. Baicich, Paul J. and Harrison, Colin J.O. 1997. Nests, Eggs, and Nestlings of North American Birds, 2nd Edition. Princeton Field Guides. Cornell Lab of Ornithology. 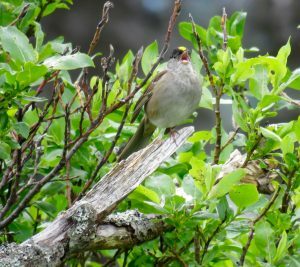 All About Birds – Golden-crowned Sparrow. https://www.allaboutbirds.org/guide/Golden-crowned_Sparrow/overview Downloaded on 6 April 2018. Dunne, Pete. 2006. Pete Dunne’s Essential Field Guide Companion: Comprehensive Resource for Identifying North American Birds. Houghton Mifflin Company. International Union for Conservation of Nature. The IUCN Red List of Threatened Species. Version 2017-3. <www.iucnredlist.org>. Downloaded on 06 April 2018. National Audubon Society. Edited by Elphick, C., Dunning, Jr. J.B., and Sibley, D.A. 2001. The Sibley Guide to Bird Life and Behavior. 2001. Alfred A. Knopf Inc.
Sibley, David Allen. 2003. The Sibley Field Guide to Birds of Western North America. Andrew Stewart Publishing Inc.
Todd, Frank S. 1994. 10,001 Titillating Tidbits of Avian Trivia. Ibis Publishing Company. Warnock, N. 2017. The Alaska WatchList 2017. Audubon Alaska, Anchorage, AK 99501. To promote the enjoyment and protection of Kachemak Bay native birds and their habitat through citizen science, field trips, education and stewardship.